At the top of a company, sales do not matter, profits do not matter, even return on investment is a secondary concern. What matters is share price and what drives share price is the creation of shareholder value. Many marketing directors, obsessed with branding and other promotional tactics, miss this fundamental truth of modern business and so destroy the wealth of their company's ultimate owners. By failing to consider and manage the business risk associated with their strategies, they deliver returns below the cost of capital and neglect the firm's raison d'etre. The board needs a way of holding these marketers to account. 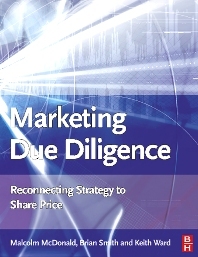 Marketing Due Diligence is a new process which has emerged from years of research at Cranfield, one of Europe's leading business schools. It blends proven ideas from strategic and financial management with new concepts about organisational effectiveness to create a process that directly connects marketing strategy to shareholder value. CEOs and CFOs cannot afford to operate without Marketing Due Diligence. Bad marketing directors cannot afford to work with it. Managing Consultant, PragMedic and Doctoral Researcher at Cranfield University, UK.